Shock, anger, disappointment – and a sense of betrayal. Those were the initial reactions of shoppers when they discovered that Ecover and Method had been acquired by SC Johnson, a company that openly admits to animal testing and whose brands include Duck, Glade, Pledge and Mr Muscle. Since Ecover was created in 1979, followed by Method in 2000, the companies have claimed to be animal-friendly. In 2012, they united to become People Against Dirty, joining forces in a competitive market that includes huge corporations such as Procter & Gamble, Clorox and Unilever. Sadly, Ecover and Method are now owned by a huge corporation and Naturewatch Foundation has revoked their cruelty-free endorsement in the Compassionate Shopping Guide. Furious at the sharp U-turn in the brands’ ethical stance, previously devoted customers have sent thousands of emails to People Against Dirty following a campaign we launched on World Day for Animals in Laboratories (April 24). Hundreds more aired their views on social media. Ecover and Method have provided unconvincing template responses to assure the public that they “remain firmly committed to no animal testing”. They have been unable to deny that their profits will now fund animal testing carried out by, or on behalf of, their new parent company. Ecover and Method both declare that “they see this as more of a really great marriage than just another business deal”. They claim that their partnership with SC Johnson will enable them “to get more people and plant friendly soap into many more homes”. Perceptive shoppers aren’t fooled. It is just another business deal. Responding to our request that they influence SC Johnson from the inside, People Against Dirty told us: “It’s early days in our new relationship and we are just getting to know each other so it’s difficult to predict the future in any detail.” A non-committal response. For the sake of their own reputation, they should convince SC Johnson to stop testing on animals before it’s too late. The initial feelings of disbelief have already turned to resignation. Customers who had been loyal to Ecover and Method for years quickly found alternatives from independent brands that are genuinely cruelty-free – and they’re happy with the results. As The Body Shop discovered following its takeover by L’Oréal in 2006, shoppers who desert a brand due to loss of trust might not return until the issue has been resolved. It took a subsequent acquisition by Natura in 2017 for The Body Shop to regain their cruelty-free credibility and, hopefully, their customers. We were delighted to be able to welcome them back to the Compassionate Shopping Guide in 2018, along with related new endorsements Natura and Aesop. It is crucial that we now send an even stronger message to SC Johnson via Ecover, Method – and ethical retailers. Ecover and Method both claim that their “success depends on you”. Finally, a valid statement. Their future and, ultimately, the future of SC Johnson really does depend on you – a significant fall in profits will speak volumes. Removing People Against Dirty from your shopping basket is a fantastic start. We now need to persuade stockists to remove them from the shelves. 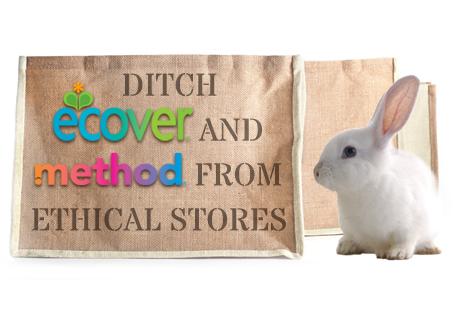 Learn More: Find out which stockists have pledged to ditch Ecover and Method products from their range. Email ethical stockists of Ecover and Method, requesting that they remove both brands from their range until SC Johnson adopts a satisfactory animal testing policy. Your email will be sent to six of the largest ethical stockists in the UK. Email Ecover and Method directly, backing our request that they influence their parent company from within. Ecover describe themselves as the ‘rebels of the cleaning world’ – ask them to start a revolution at SC Johnson, with Method’s support. Visit your local independent health shop or ethical store and request that they remove Ecover and Method from the shelves. Ask them to contact us at info@naturewatch.org for more information.